Rugby prop forwards in a yoga class? It's happening across the city as yoga no longer remains the domain of women or guru types. Duncan Peak, a former parachute officer turned yoga teacher, is an Australian pioneer of a new form of yoga attracting many men. Power yoga, or vinyasa, was developed in the 1990s by an American, Baron Baptiste, whose client list includes the Philadelphia Eagles gridiron team. But it has only recently arrived in Sydney. The Australian Bureau of Statistics says 85 per cent of yoga pupils are women, but Mr Peak said at least a third of his power yoga pupils at the Body Mind Life gym in Neutral Bay were men. "We get a lot of guys who have pumped weights … who come here to nurse their old injuries or reclaim the flexibility they used to have," Mr Peak said. "Guys can relate to it a lot more. It's very intense, one of the hardest workouts anyone can experience. But the relaxed state you feel afterwards is quite foreign to a lot of guys who have been used to the gym all their lives and never looked at holistic exercise." 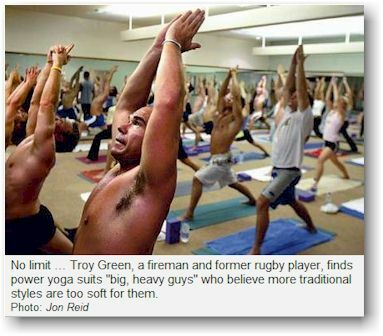 Troy Green, 33, a fireman, former prop forward and keen bodybuilder who weighs 100 kilograms, said: "I tried yoga before but didn't really get into it." What he liked was that so many of his new classmates were "big, heavy guys", he said. And what he enjoyed most was the feeling afterwards. "It honestly makes me feel like waving at strangers. It's just like having a good surf." Stephen Penman, co-author of a study by RMIT University into yoga in Australia, said power yoga was one of several styles helping to convert men to yoga as a sport. "Some styles of yoga attract men more than others, particularly the more aerobic, physical forms. Guys hardly turn up at all for the classical, more gentle styles." But Moina Bower, president of the Sydney-based International Yoga Teachers Association, disagreed. She has noticed a rise in male pupils in her more traditional classes. "Ten years ago it used to be 10 per cent; now it's about 25 per cent." Many of her male pupils were businessmen looking for something to relieve stress, not something involving "performance anxiety", she said.